1. Bandicam now provides a profile for the NVENC H.264 codec. 2. 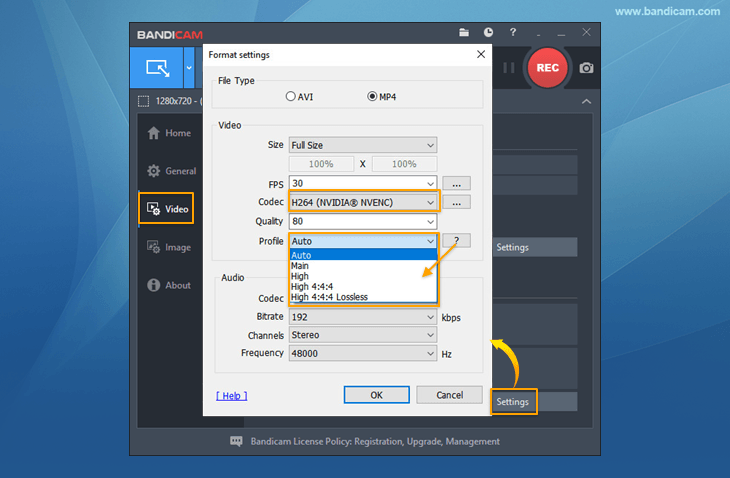 Bandicam now supports the lossless video encoding of the NVENC H.264 codec (Lossless H264, High 4:4:4 profile). 3. Added the 'bdcam_safemode' shortcut to start Bandicam in Safe Mode. 4. Added an option to flip the screen horizontally/vertically in the webcam overlay menu. 5. Added an option to flip the screen horizontally/vertically in Device Recording Mode. 6. Improved the recording performance of the H.264 (CPU) codec. 7. Bandicam version and encoder type information will be added to the recorded video. - Bandicam crashed when the record hotkey was pressed if the recording mode was not selected. - Failed to initialize video capture device under certain conditions. - The Non-Admin mode of Bandicam (bdcam_nonadmin.exe) didn't work on some computers.